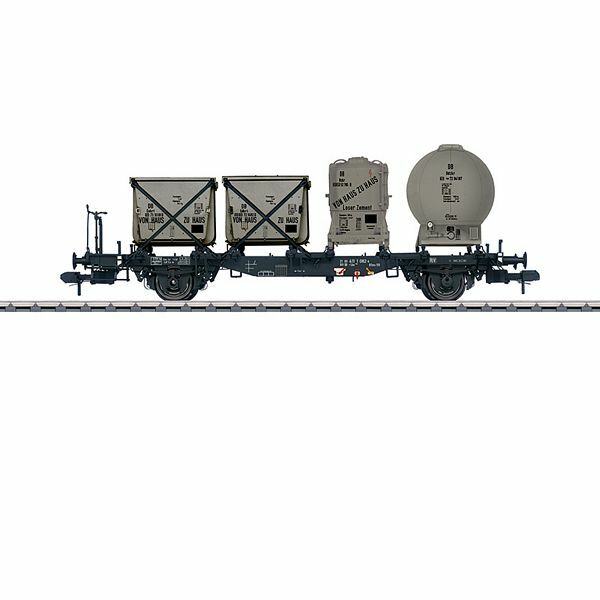 Prototype: German Federal Railroad (DB) type Lbs 584 container transport car. The car looks as it did in Era IVa. It is loaded with four (4) different "pa" containers. 1 each "pa" type Edkrt covered container, 1 each "pa" type Eokrt open container, 1 each "pa" type Dzkr double container, and 1 each "pa" type Ddzkr spherical container. Car number 21 80 411 1 082-4. Model: The frame is constructed of die-cast zinc. The car has many separately applied details made of high quality plastic. The car is loaded with 4 removable "pa" containers. The containers have separately applied details and different registration numbers. The minimum radius for operation is 1,020 mm / 40-3/16". Length over the buffers 36.0 cm / 14-3/16".